Ready for some educational fun! 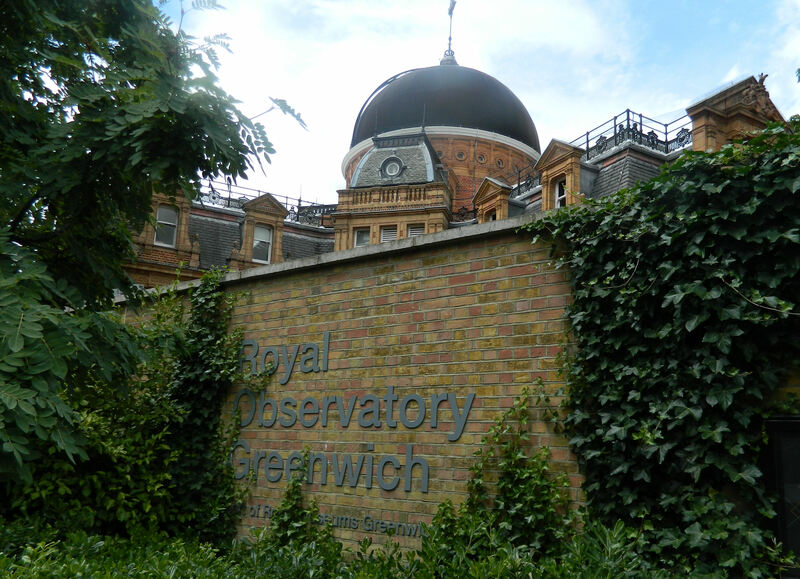 Honestly, I’ve never really given much thought to “Greenwich Mean Time,” and what that actually means. 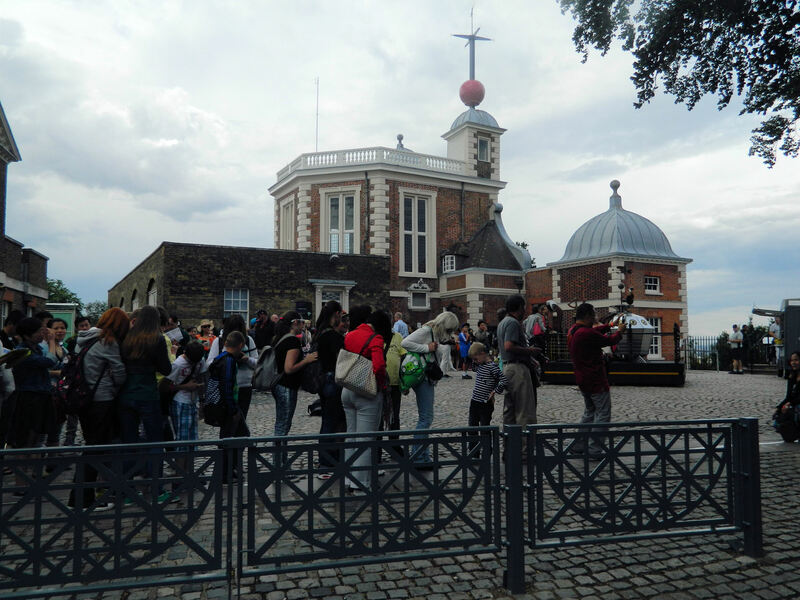 But during a recent trip to Greenwich, England I not only learned a lot about it – I also got to stand in two different hemispheres at the same time! As mentioned previously, I was sent to London earlier this summer to cover a conference. I flew in a day earlier than needed so I could run around to outside-the-city sites such as Windsor Castle and the wonderfully strange and mysterious Stonehenge. And I tacked on 2 extra days at the end to go visit a good friend and colleague. Zosia and I both write for the same medical news company but I’m based in Arkansas and she lives about 40 minutes outside of London by train. I was thrilled when she invited me to come stay a few days with her – and she promised to take me around to some of her favorite places. 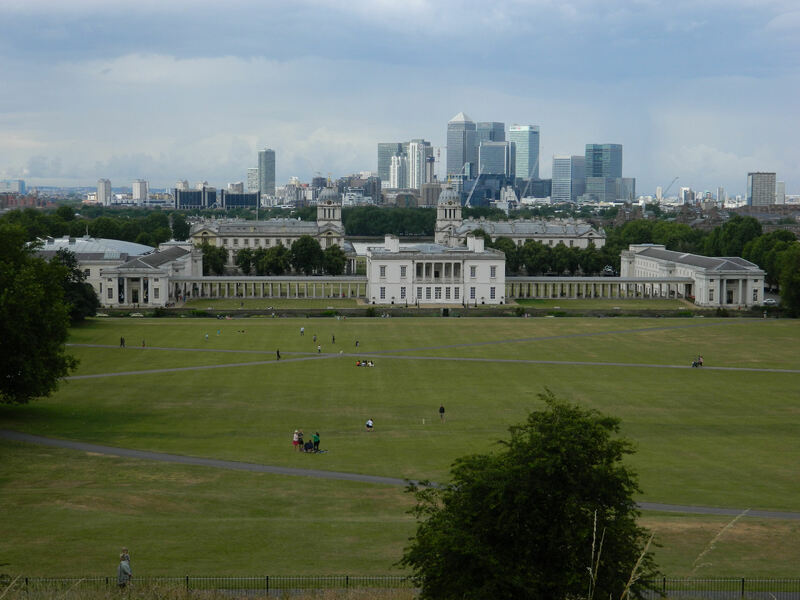 First on her agenda, after picking me up from the train station, was driving over and spending the day in Greenwich at an area that includes a LOT of different attractions, including the Royal Observatory, the National Maritime Museum, and the Old Royal Naval College (ORNC). So of course we started our tour at the Royal Observatory, which is the official home of the Prime Meridian and Greenwich Mean Time. 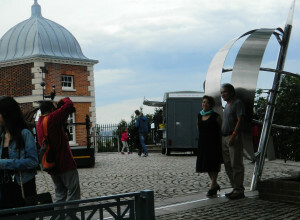 Or, rather, we started by looking through the gates into the site’s courtyard. We saw a long line of people who had paid to get into the museum and were now waiting to get their pictures taken standing over the bronze line embedded into the ground marking the meeting point of the East and West hemispheres at Longitude 0º 0′ 0″. I was all ready to do this myself but it’s worth having a friend who had been there many times before! Notice the line on the ground by the feet of the picture couple on the right? She led me through another small gate and down a narrow path, where the continuing line was still marked. And there was hardly anybody else there! 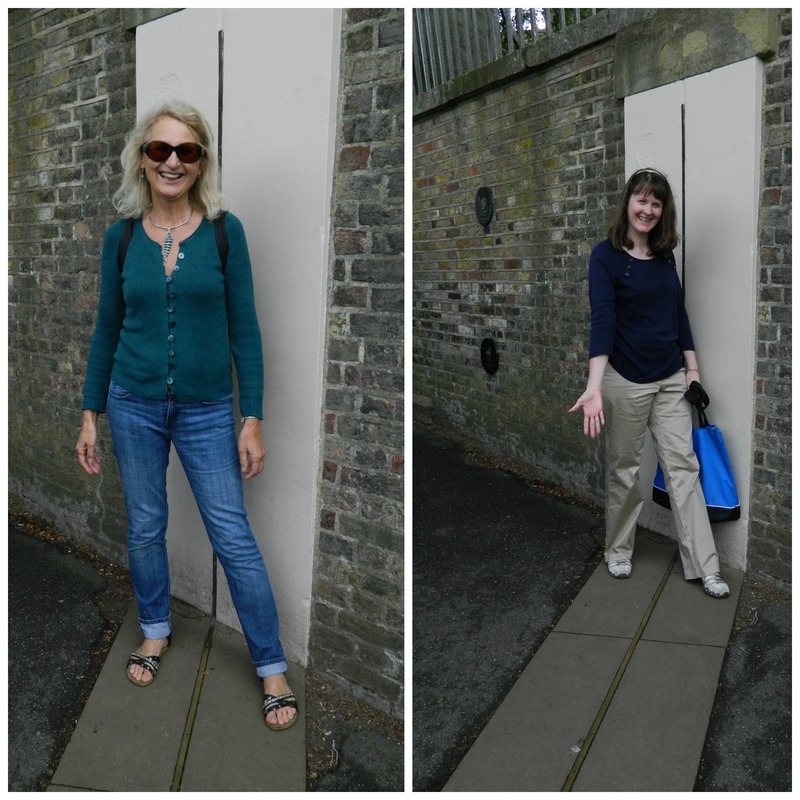 Here are our “over the line” pictures. Don’t we look clever? 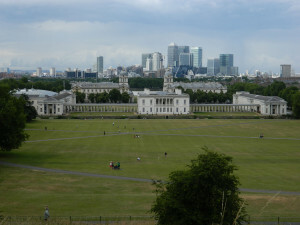 Zosia suggested that we make our way down the hill and towards the two domed buildings behind the college’s front that look almost identical from the outside. But boy are their interiors different! 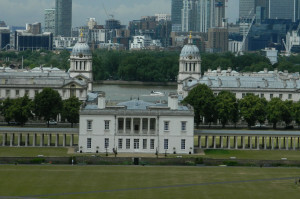 Its original construction was finished in 1751 but it burned down in 1779. 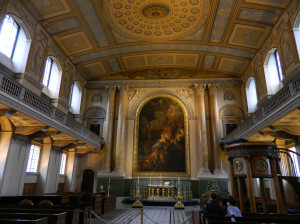 Nevertheless, it was rebuilt and redecorated in a stunning “Greek Revival” style. 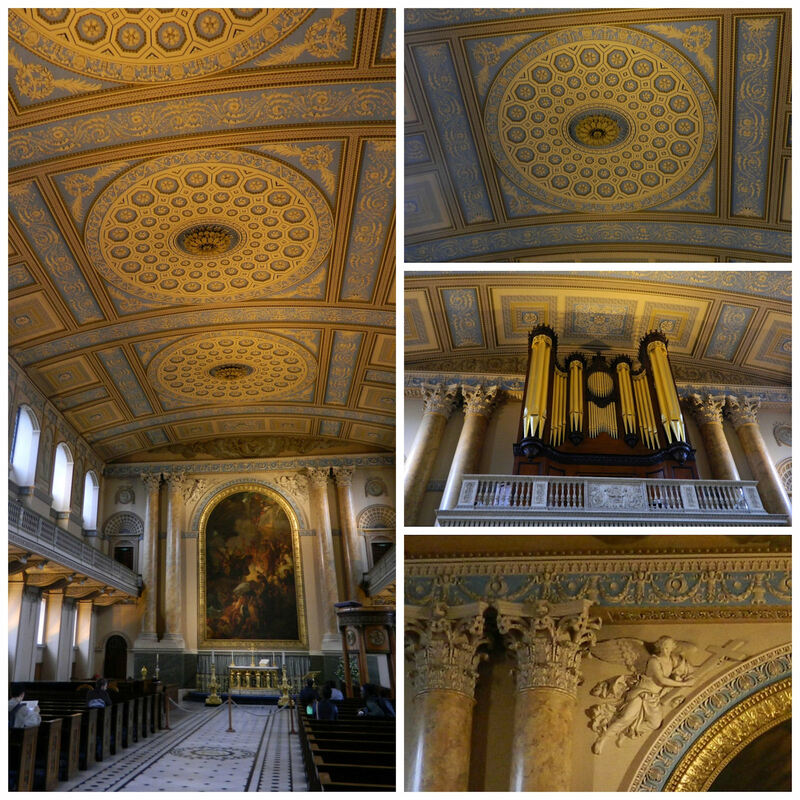 I fell in love with the Wedgwood blue and gold circular treatments and panels on the rounded ceiling and the gorgeous trompe l’oeil decorations on the walls and in between its many windows. Oh, and the Spanish mahogany pipe organ built in 1789! 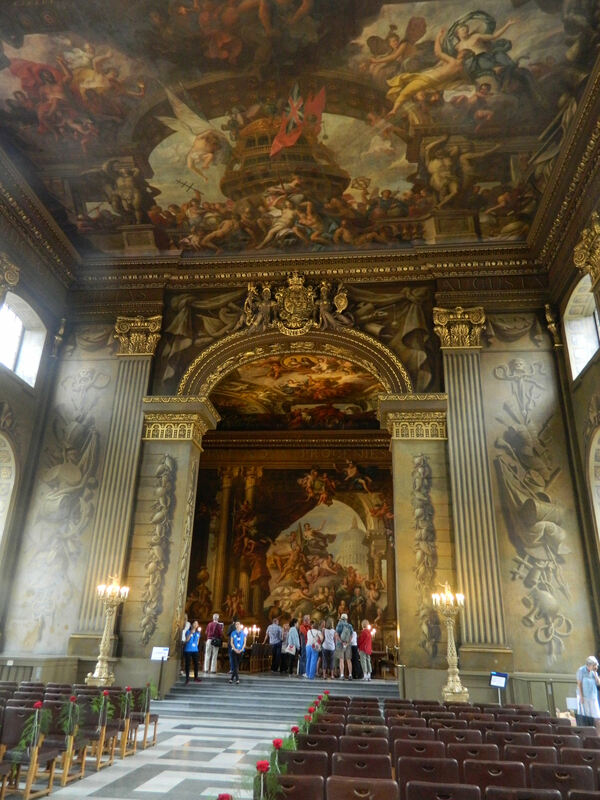 Next, we went into the ORNC’s incredible Painted Hall, which was also free. Seriously, this was one of the most beautiful rooms I had ever stepped into. What a complete surprise! How had I never heard of this masterpiece?? There’s an elaborately hand painted mural on the ceiling inside the first room, which serves as an entertainment area (and was going to host a very expensive wedding that night). 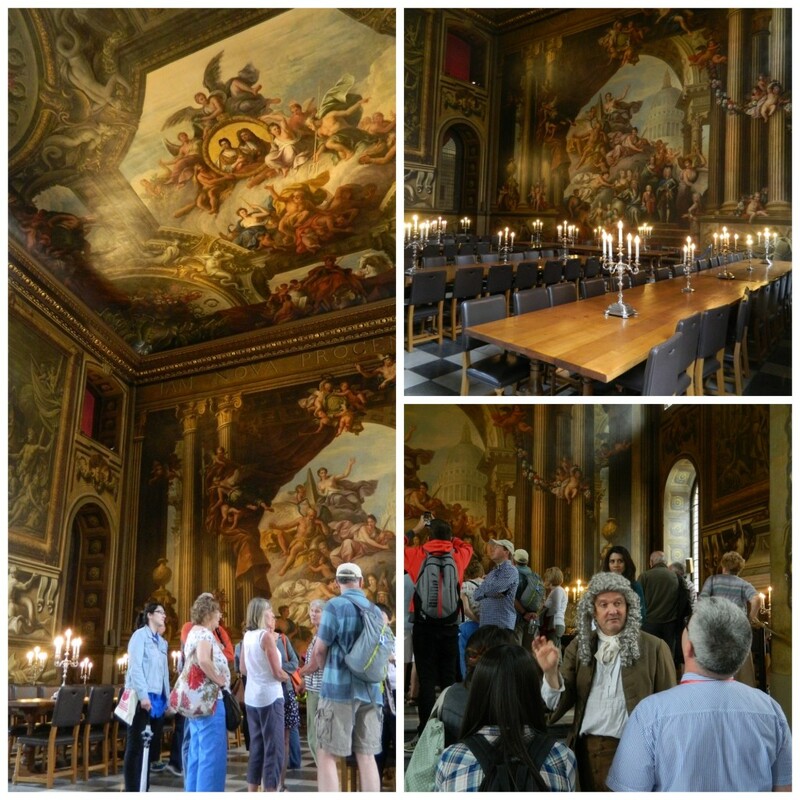 And more hand-painted murals adorn the ceilings and walls inside the adjoining dining room. Wowza! Originally designed in 1698 as an eating space for naval veterans, the Hall instead quickly became a tourist attraction and even the National Gallery of Naval Art between 1824 and 1936. Frankly, I just had to sit down, lay back, and tilt my head up to gaze at the first room’s mural for quite a while. Slowly, more and more details became apparent, as did several story threads. The artist, James Thornhill, was told to include as many references to the British Navy as possible – a job that took him 19 years to complete! 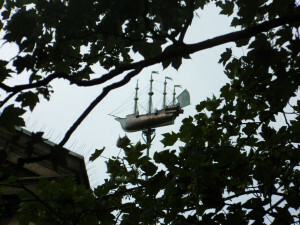 Next, I wanted to check out the ship that belonged to the large masts I first spied earlier from the overlook. 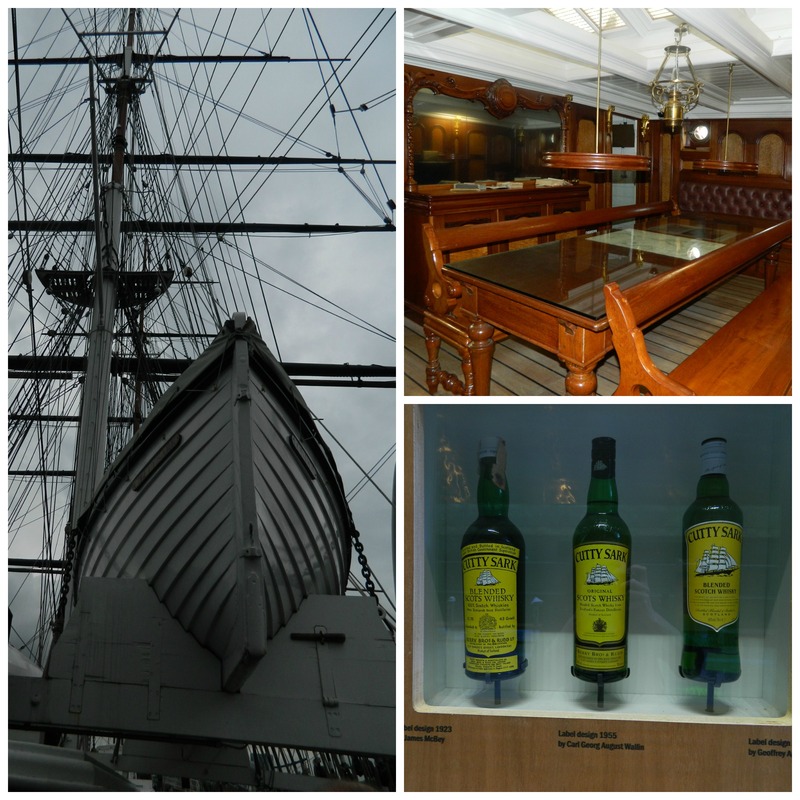 The restored Cutty Sark is billed as the world’s only surviving tea clipper ship. An entry fee lets visitors explore the top decks, the inside cabins for the crew and officers, and even an exhibit that shows pictures and items from the ship’s storied past. 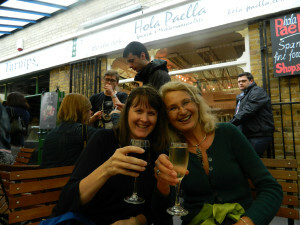 Afterwards, it started raining (big surprise – we were in England!) So we headed over to eat at the super delicious and very reasonably priced Greenwich Market, which was made up of a bunch of international food booths under one large roof. It was absolutely a perfect day ender. Cheers! What a fascinating and beautiful place to get to tour. Your posts make me feel like I am right there with you. Thanks for the great stories and pictures. Thanks for the nice comments! It definitely is well worth the visit, and I hear there’s a ton more stuff to do there. Really cool! Yeah, the painted room was my favorite too, Darlene. And you’re right – having a friend to show all the tips and secrets of a place is wonderful! What an adventure! And so cool that you had your own little adventure over the line; nice not having to stand and wait! The murals are absolutely beautiful. And the Market sounds like a wonderful place to eat. Thanks so much for sharing at Inspire Me Wednesday. Featuring you in next week’s issue. So glad you enjoyed reading about it — and seeing the pics Mel! And thank you so much for featuring me next week. 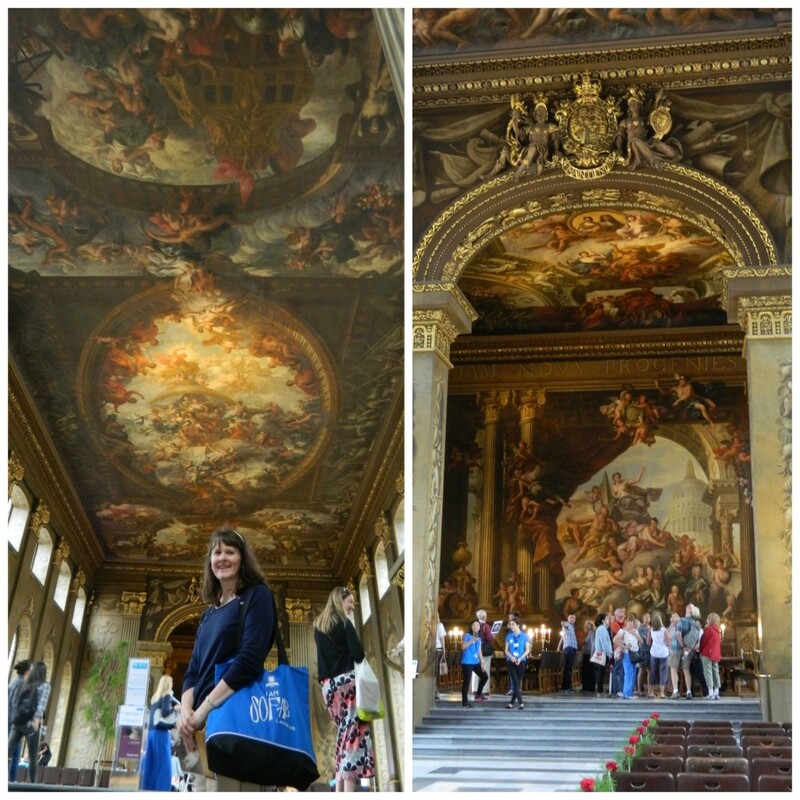 All the amazing art on the ceilings would have required several days recovery from a stiff neck but well worth it. Truly an incredible place. It was incredible Sandy! I really feel like I could have stayed a couple hours there – at least!